Aslan Şükür is a Turkish cover artist. Aslan Şükür was born in Bafra in 1945, and in 1962 he and his family moved to Istanbul. He dropped out of high school and have no formal training in arts. When he was young he was influenced by the work of Remzi Türemen and Nehar Tüblek. 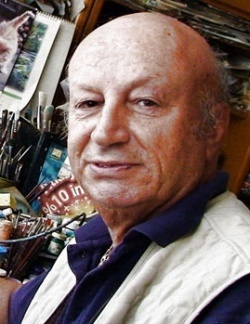 Aslan Şükür began doing comics covers for Tay Yayınları in 1970 and became their most prolific cover artist over the years. He made covers for various comic books, such as: Zagor, Mister No, Tom Braks, Apo, Mini Ringo, Atlantis, Martin Mystere, Alaska, Ken Parker, Jeriko, Jil, Judas, Kızılmaske, Mandrake, Karaoğlan, Teksas, Tommiks, Flash Gordon. In addition to his work for Tay, he also illustrated covers of several children's books for various other publishers. The book Ahyaaak ! from 2014 presents a selection of his work. This page was last edited on 25 September 2017, at 18:54.